Good performance. MSI's latest 14-inch laptop is to be a mobile and powerful companion. The potent Core i5 processor aside a weight of 2.4 kg underpins this statement. 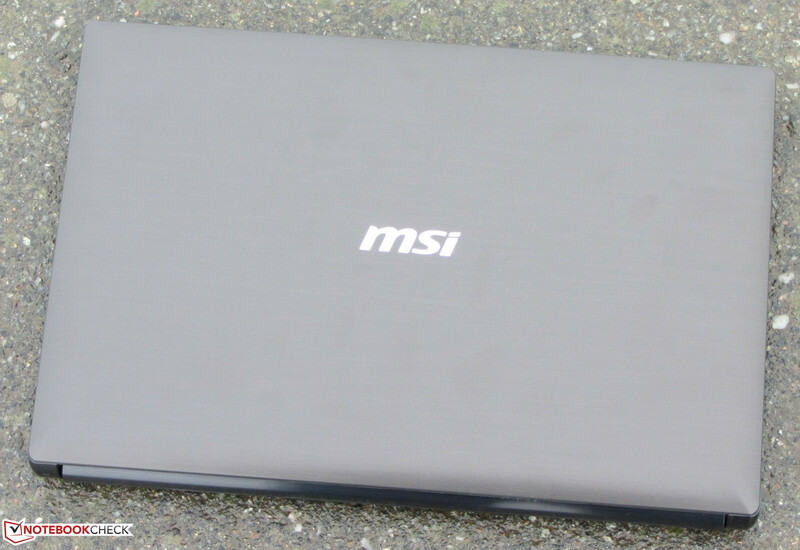 Our review reveals whether MSI's CR41 is compelling. 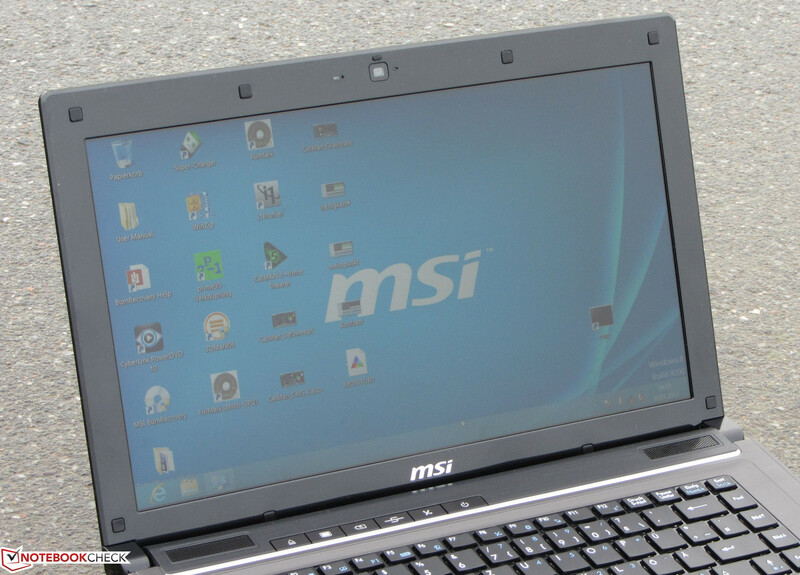 MSI sends a 14-inch laptop dubbed CR41 into the race to win over customers. Intel's Core i5-3210M processor, 8 GB of working memory and a standard 1366x768 pixel screen on the hardware list does not encompass any surprises. 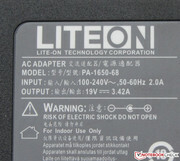 Other manufacturers have similar devices also for around 600 Euros (~$798) in their range. We will see whether the CR41 can stick out positively in our test report. We used Dell's Vostro 3460 (Core i5-3210M, GeForce GT 630M) and Asus' B43E (Core i3-2350M, Intel HD Graphics 3000) to compare and classify the laptop. The CR41's entire casing is made of gray-black plastic. Most surfaces feature a polished matte color. Only the display bezel and keyboard gaps are reflective. The base unit's top looks are to imply brushed aluminum. However, this is not deceptive even for a second. The display's back is all over sleek and very susceptible to fingerprints at the same time. Most contenders also use plastic. However, they set contrasts by using higher quality materials. For example, the display backs of the Vostro 3460 and B43E are comprised of aluminum. 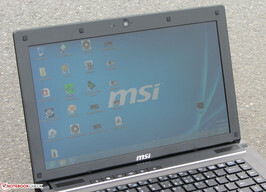 The casing of MSI's laptop could be more rigid. The right part of the wrist rest can be dented quite severely. 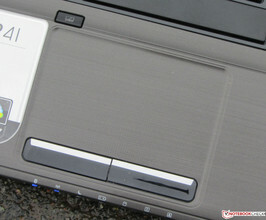 The base unit also easily yields in the touchpad's area and a cracking sound is audible from the casing. Also, the casing can be warped a bit too extremely when it is picked up at the base unit's front corners. The same applies to the laptop's lid. The hinges keep the lid firmly in position and it is not possible to open the lid with one hand. Minor manufacturing flaws also exist. For example, single irregular gaps are found and the touchpad's mouse keys are not parallel to each other. Furthermore, taking out the battery also proves to be awkward. A small recess for the finger is located in front of the battery compartment. Not only the battery's edge but also an edge from the casing is above this recess. When removing the battery the finger often snags at the edge. The CR41's connectivity does not exhibit any surprises and corresponds to that found in most modern laptops. The number and type of interfaces is virtually the same as on the Vostro 3460. The only difference is that the Vostro features four USB 3.0 ports while the CR41 sports two USB 3.0 and two USB 2.0 ports. The B43E features better equipment with an ExpressCard slot, an eSATA / USB combo port and a docking port in addition to those found on the contenders. The CR41's interface distribution is a bit adverse. 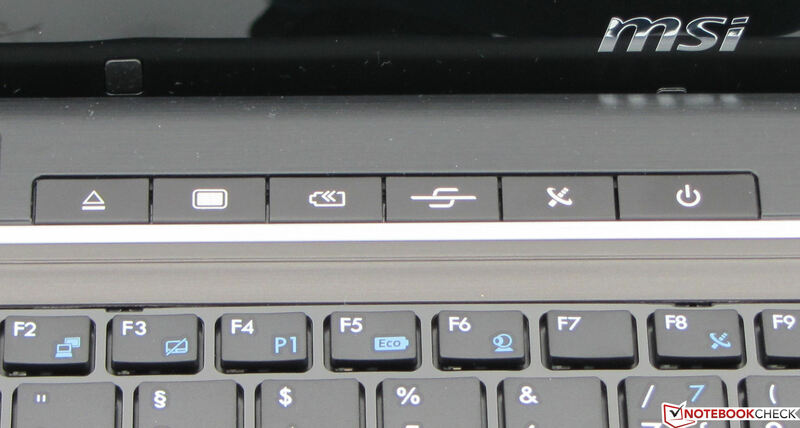 Almost all interfaces are in the laptop's left and right front area. 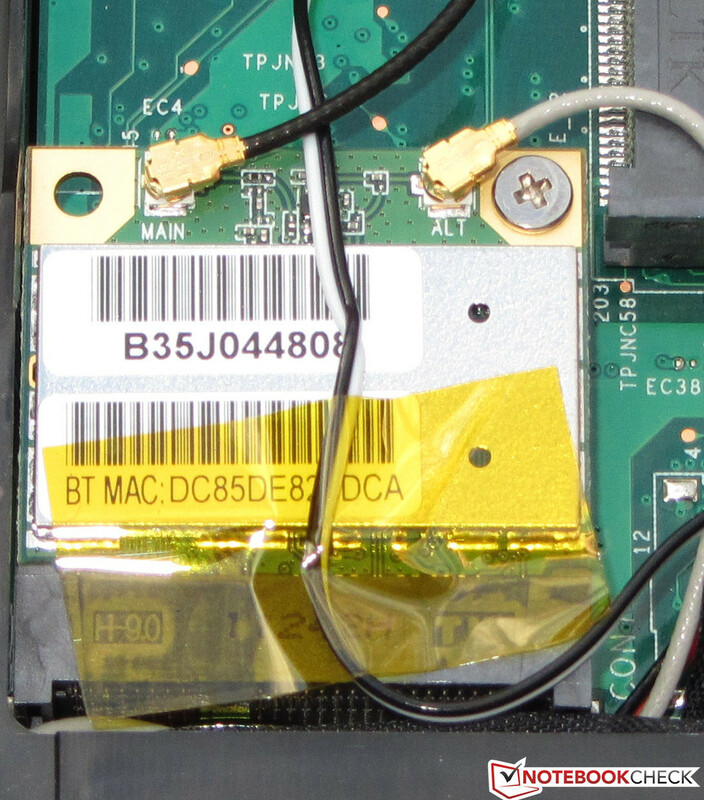 MSI uses a Wi-Fi module from Atheros dubbed AR1111 in the CR41. It supports the 802.11 b/g/n standard. The transmission performance gave no reason for complaint. 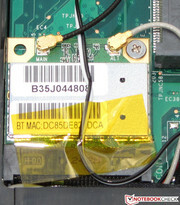 The Windows Wi-Fi indicator displayed the full-scale deflection in both the router's immediate vicinity of approx. 3 meters as well as two stories below it. The router's transmission performance was roughly 50%. MSI sticks to a familiar Gigabit Ethernet model which is installed in many laptops with Realtek's RTL8168/8111 chip. MSI's CR41 even sports Bluetooth 4.0. Fans of video calls will be happy about the 1.3 megapixel webcam. The usual accessories are included with the laptop: a quick start poster, a leaflet with warranty information and very short instructions about a few Windows 8 functions. Compliantly, a driver DVD is included, although only with drivers for Windows 8. Windows 8 (64 bit) is preinstalled on the CR41 when it comes to the buyer. An installation DVD is not included. 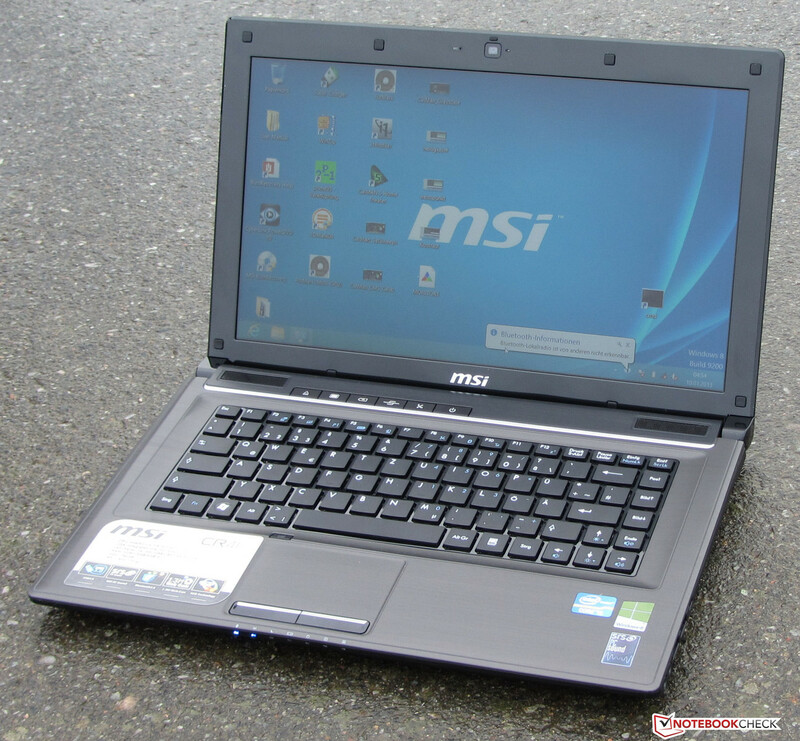 MSI provides the necessary Windows 7 drivers to replace Windows 8 on its website if preferred. As is usual nowadays, MSI's laptop features a recovery system. It enables the user to reset the operating system to factory settings. This could become necessary when Windows 8 refuses to boot. 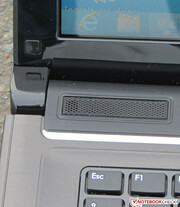 The recovery system is opened by pressing the F3 key after turning on the laptop. The CR41 proves to be very easy to maintain. The big maintenance cover allows accessing the working memory, hard drive, Wi-Fi module, fan and processor. 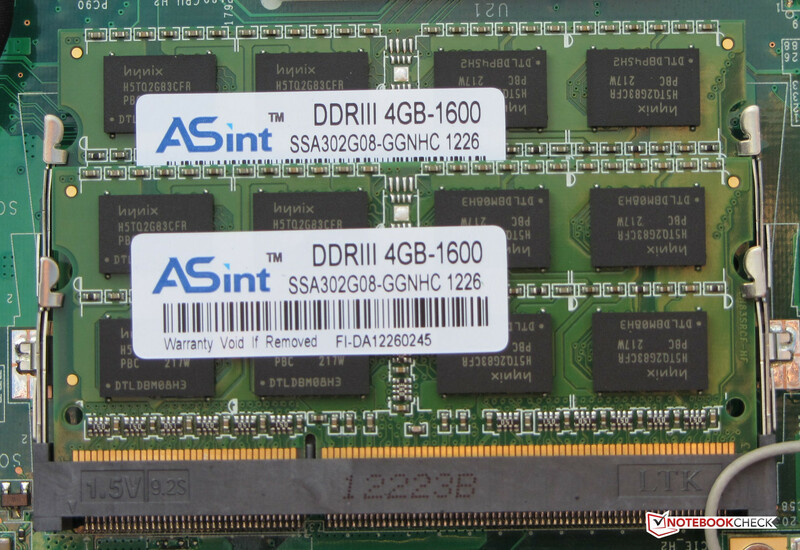 Both working memory banks in the 14-incher sport a 4 GB module. 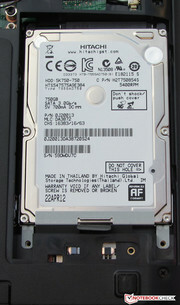 Thus, the device is equipped with the maximum 8 GB specified by the manufacturer. The hard drive could be replaced quickly. 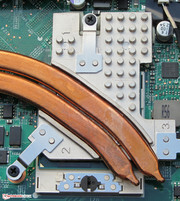 Simply pull out the old drive, fasten the new drive to the hard drive bezel and insert it into the laptop again - ready. We appreciate the full access to the fan. It could even be easily removed for cleaning. It is also possible to access the processor. Buyers of the CR41 get a 24 month warranty on the laptop including pick-up & return. Asus' B43E also includes this warranty period. The warranty period for the Vostro depends on where the laptop is bought. For example, the buyer receives a one year warranty when the laptop is purchased from Dell but two years when it is bought in another shop. As known from Dell, this warranty can be upgraded. 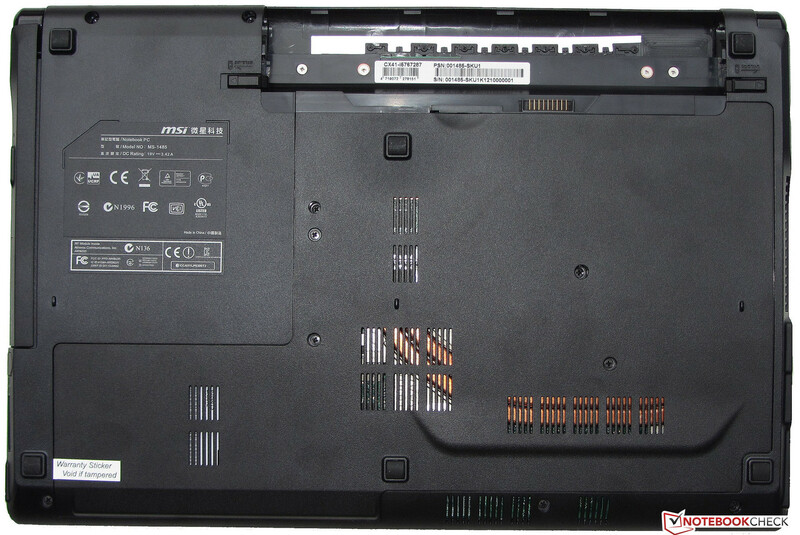 The warranty for MSI's laptop can also be upgraded. A three year warranty period costs 130 Euros (~$173). MSI installs a chiclet keyboard in the CR41. There is no room for a number pad. The main keys feature a size of 15 x 15 mm and a slight concave curve. The keys exhibit a medium drop and provide the fingers with a pleasant resistance. The pressure point is clear. The keyboard barely yields anywhere. It only dents a bit stronger over the DVD burner. The enter, backspace and right shift key are regrettably a bit too small and thus easily missed. 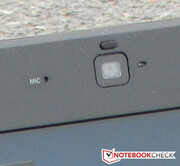 The CR41's Elan touchpad has a size of 7.6 x 4.5 cm. The minute dots on the surface do not impair the finger from gliding. 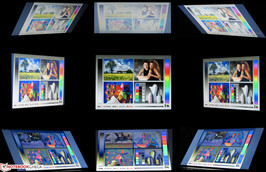 The multi-touch capable pad supports common gestures like pinch-to-zoom on pictures. The single gestures can be turned on and off in the setup menu. In our opinion, the touchpad is a bit too sensitive in the default settings. Unintentional mouse clicks were often triggered while moving the cursor. However, this should not be a problem since the responsiveness can be adjusted in the setup menu. A small button above the pad turns it on and off. Both mouse keys feature a short drop and a clearly audible and palpable pressure point. A minor blemish: the keys are not quite parallel. We cannot say whether this is a series fault or whether it is an isolated case. 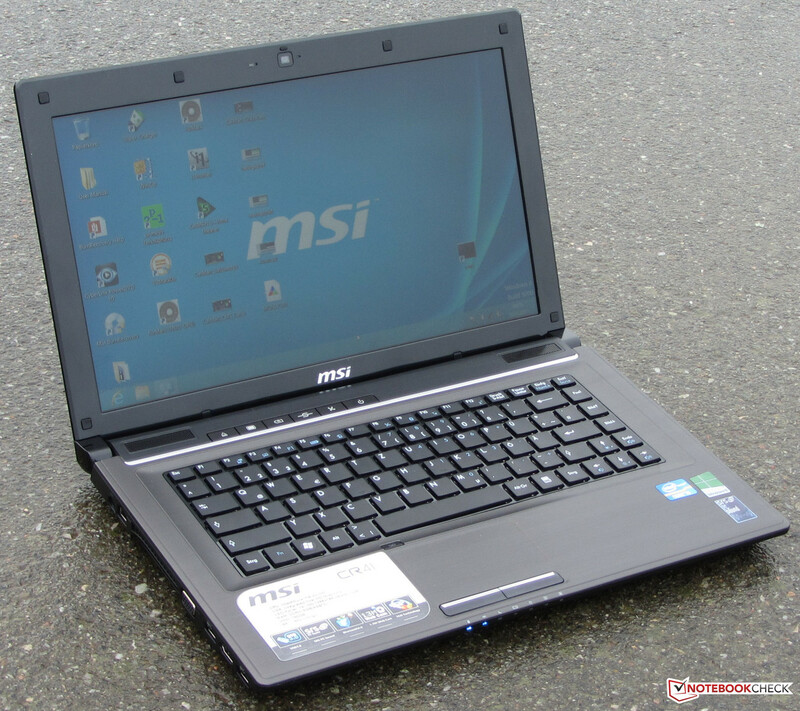 The glossy 14-inch screen in MSI's laptop features a native resolution of 1366x768 pixels. Other screen models are not offered. 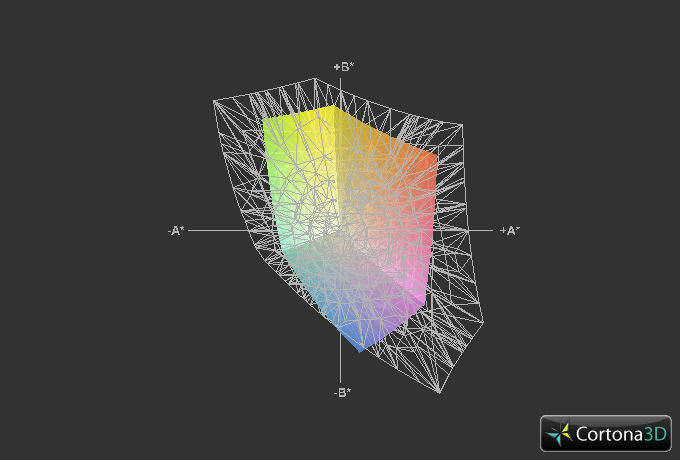 The screen's average brightness of 193.6 cd/m² is in the lower midfield. 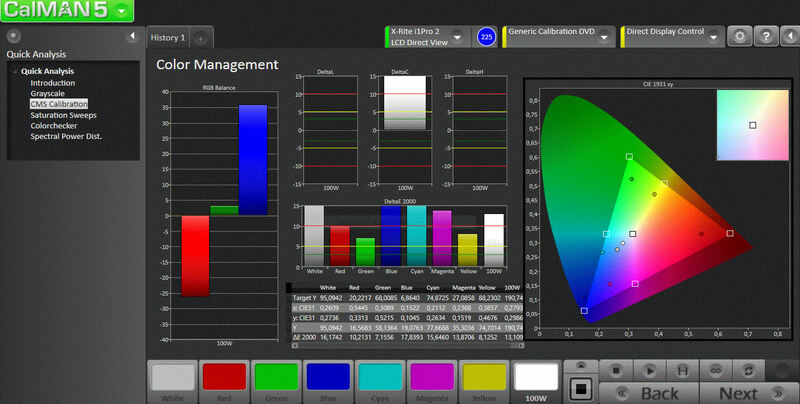 The brightness of the B43E's screen is only marginally higher with 204.3 cd/m². The Vostro's rate of 149.8 cd/m² is much worse. The brightness distribution of 77% on MSI's screen could be much better. Asus (92%) and Dell (89%) are in the lead here. The contrast of 500:1 and black value of 0.44 cd/m² are within a very acceptable range. The rates from the Vostro 3460 (159:1; 0.97 cd/m²) and Asus' B43E (206:1; 1.03 cd/m²) cannot compete with that. The CR41's screen can neither reproduce the AdobeRGB nor sRGB color spectrum. 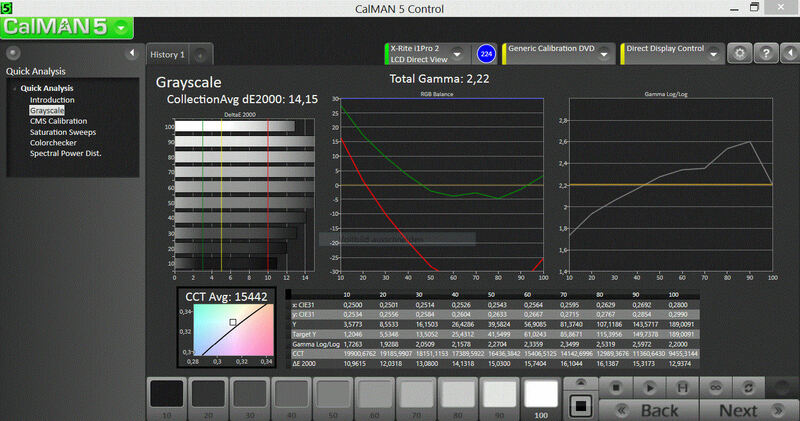 We measured the screen using X-rite i1 Pro 2 before calibration and ascertained strong DeltaE 2000 deviations. 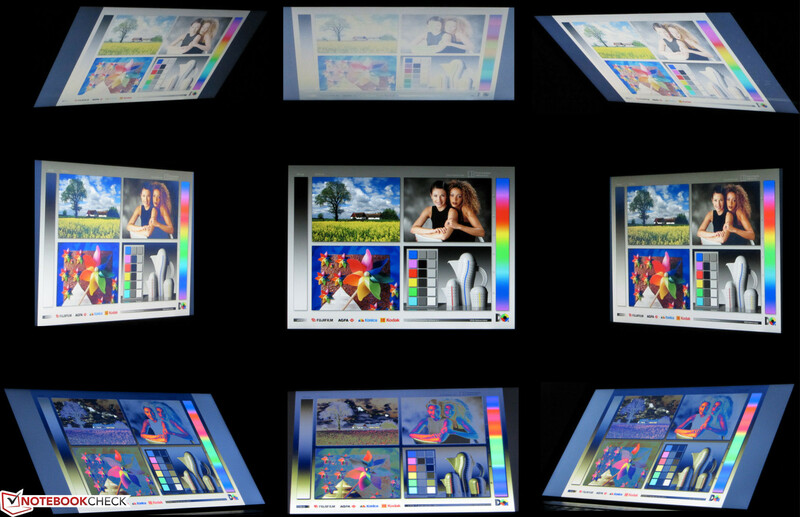 The space between the single RGB colors is very large due to the uncovered sRGB color gamut. A blue cast is visible in state of delivery. Both characteristics are typical for low-budget screens. The screen is just bright enough for outdoor use. However, very bright surroundings should be avoided because the reflective surface thwarts any such plans. The CR41's viewing angle stability is on the assumed level considering the price. The picture quickly distorts when changing the vertical viewing angle. The viewing angle is somewhat more stable horizontally. 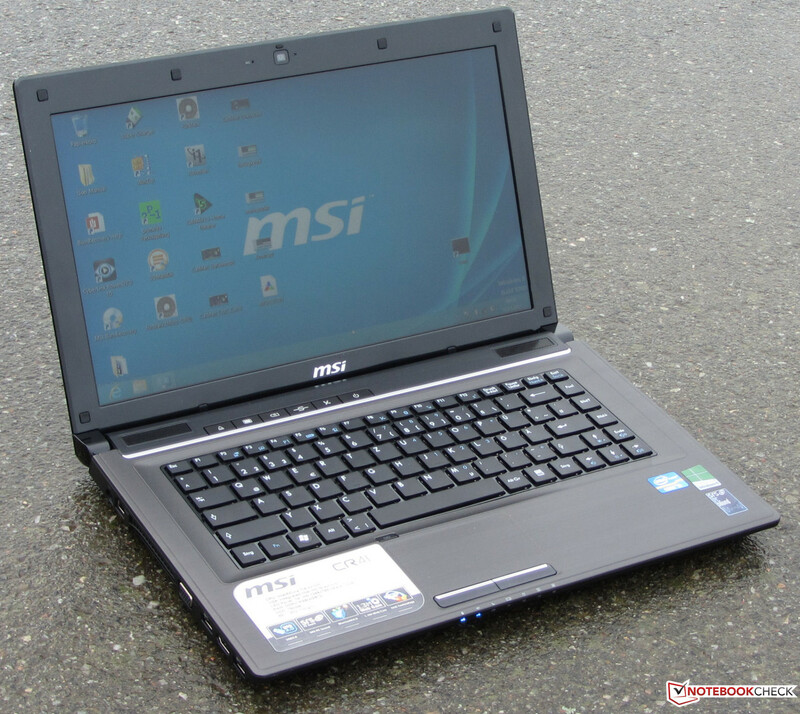 MSI has a 14-inch laptop for approximately 600 Euros (~$798) in its range with the CR41. Owing to the Core i5 processor, the laptop has enough power for everyday applications such as video calls, internet browsing, word processing and video playback. Computer games are not the 14-incher's terrain. 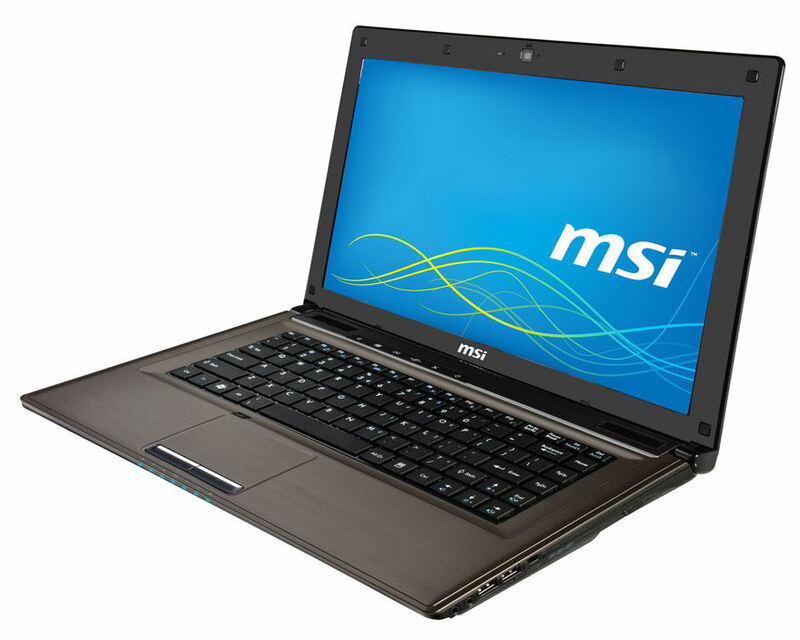 According to MSI's website, the CR41 is available in diverse versions featuring Core i3 or Core i5 processors and various hard drives. Intel's Core i5-3210M dual-core processor beats inside the CR41. The CPU comes from Intel's Ivy Bridge processor generation and has a default clock frequency of 2.5 GHz. The clock rate can be increased up to 2.9 GHz (both cores) or 3.1 GHz (one core) via Turbo. The processor finished the Cinebench tests with full speed. One core is occasionally boosted to 3.1 GHz in the single-thread tests. The CPU benchmark scores from both the CR41 and Vostro (Core i5-3210M, GeForce GT 630M) are virtually identical since the same CPU powers both laptops. The B43E (Core i3-2350M, HD Graphics 3000) lags behind both contenders because it features the weakest CPU of the three compared laptops. The Vostro clearly wins the GL tests since the GeForce GPU is far superior to both Intel GPUs. A look at the comparison graph of the Cinebench R11.5 GL tests shows that the IdeaPad S400 delivers a much lower score despite the same GPU. The reason for this is that the S400's GPU rarely clocks at full speed. The system runs quickly and smoothly. 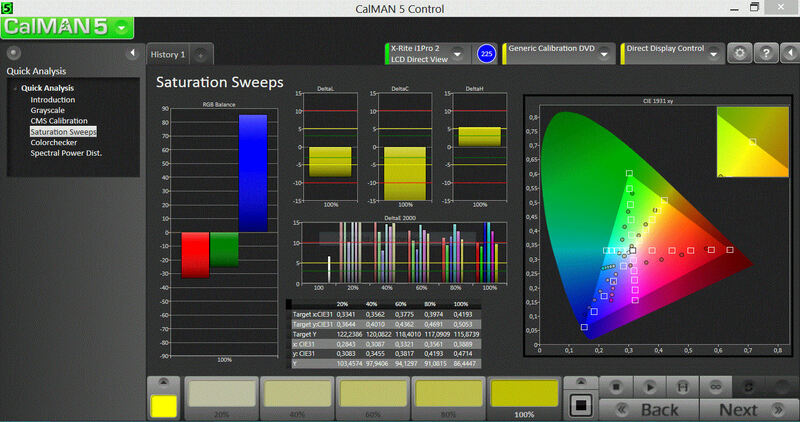 The exceptionally good result in the PCMark 7 benchmark confirms this subjective impression. The results from the Vostro (Core i5-3210M, GeForce GT 630M) is roughly 10% higher than that of the CR41. This is because a fast SSD cache supports Dell's laptop. We cannot provide any scores for the B43E (Core i3-2350M, HD Graphics 3000). 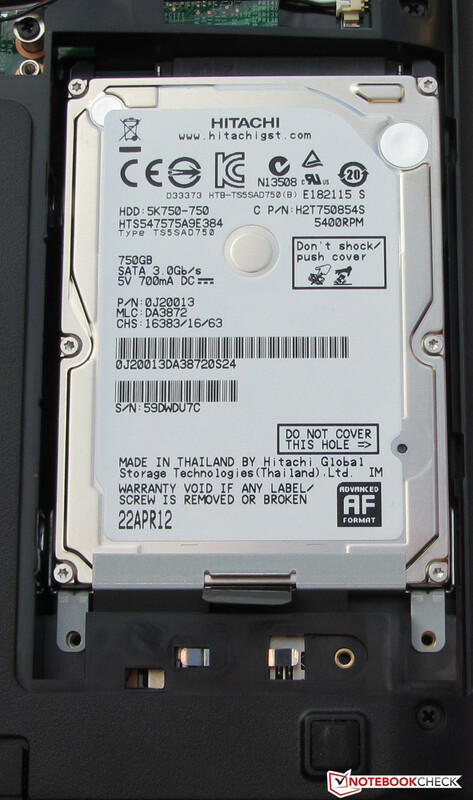 MSI installs a hard drive from Hitachi's Travelstar 5K750 range in our test device. It spins at 5400 revolutions per minute and features a storage capacity of 750 GB. Thus, there is enough storage available for innumerable pictures, music or video files. The hard drive is pre-partitioned in state of delivery. In addition to the 17 GB recovery partition, there is an operating system partition of 483 GB and a data partition of 197 GB. CrystalDiskMark recorded a read speed of 91.28 MB/s. HDTune ascertained an average transfer rate of 69.8 MB/s. These rates are in the lower midfield for 5400 rpm hard drives. Users who do not need much storage capacity could replace the hard drive with a much faster solid state drive. Intel's HD Graphics 4000 GPU is responsible for video output. It supports DirectX 11 and clocks with speeds between 350 and 1100 MHz. The 3DMark benchmark scores belong to the top rates that we have ever ascertained for the combination of a Core i5-3210M and HD Graphics 4000. The CR41 even achieved the best result for this CPU-GPU combination in the latest 3DMark 11. Here it is noticed that the working memory operates in dual-channel mode. Naturally, the scores do not reach the results of the Vostro 3460 (Core i5-3210M, GeForce GT 630M) because the GeForce GPU is much stronger. It is not surprising that the B43E (Core i3-2350M, HD Graphics 3000) lags behind both contenders. MSI's CR41 is not made for computer games. It can at most display up-to-date 3D games in both low resolutions and quality settings on the screen. A few games with low requirements on the GPU, for example the FIFA series, will also still run smoothly in higher resolutions or quality settings. We ascertained a noise development ranging from 32.5 to 36 dB in idle. This rate even increased to 39.7 dB when the DVD drive was employed. 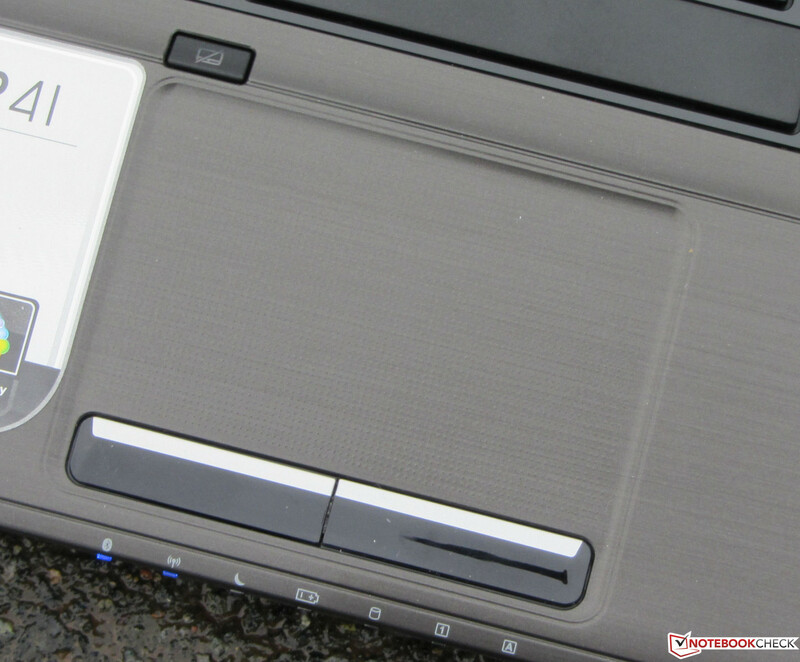 The CR41 could be a lot quieter as the recently reviewed 14-inch Asus P45VJ (Core i5-3210M, GeForce GT 635M) proved. Despite its stronger components, its idle noise level of 30 to 31.9 dB is much lower. The B43E (32.1 to 33.4 dB) is on a similar level as the CR41. The Vostro is much louder than the contenders with 36.5 6 to 39.9 dB. The CR41 increases its noise considerably during load and achieved rates ranging from 42.9 dB (medium load via 3DMark06) and 46.6 dB (full load via Prime95 and Furmark). The Vostro (45.4 and 46 dB respectively) makes just as much noise as the CR41. Asus' B43E is much quieter with 37.7 and 38 dB respectively. The CR41 was within an acceptable temperature range while idle. We measured temperatures between 25.1 and 29 °C. 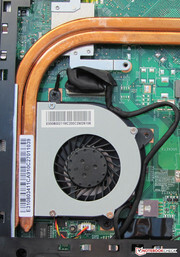 MSI's laptop heated up moderately from 27.7 to 44.7 °C during load. This still allows using the device on the lap regardless of the load range. The temperatures of Asus' laptop are roughly on a par with the CR41. The Vostro heats up much stronger than the competition in every load range. The CPU and GPU processed the stress test (Prime95 and Furmark run for at least one hour) with full speed (2.9 GHz and 1100 MHz respectively) in AC mode. 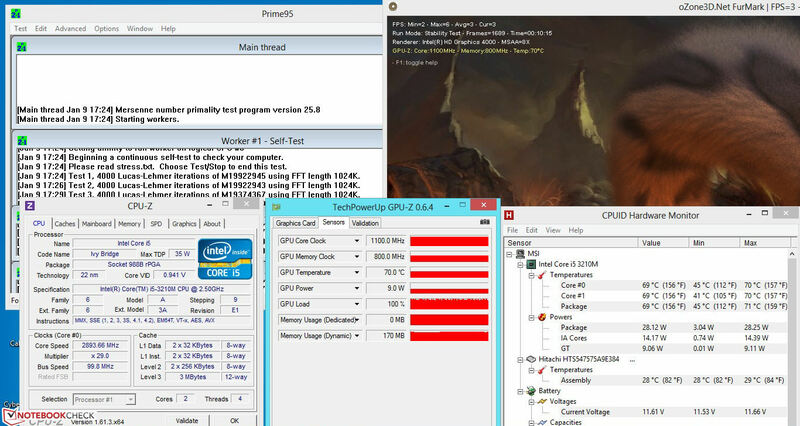 The CPU also finished the stress test with 2.9 GHz on battery power, but the GPU throttled to 650 MHz. If desired, the throttling could be disabled in Intel's driver menu. The CPU's temperature settled to 69/70 °C in AC mode. 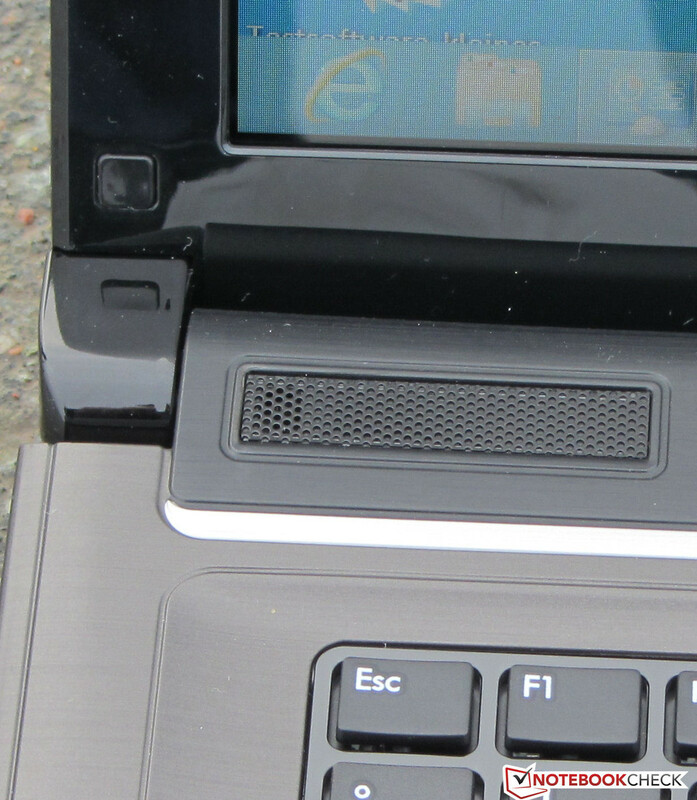 The CR41's stereo speakers are located above the keyboard, directly beside the hinges. They are both protected by a small, perforated cover. The speakers sound very thin in default settings. 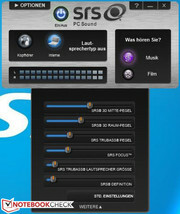 However, the laptop generates a pleasant sound when the preinstalled SRS PC Sound software is enabled. Watching a movie does not turn into acoustic anguish. Users with higher sound expectations can always connect external speakers or headphones. 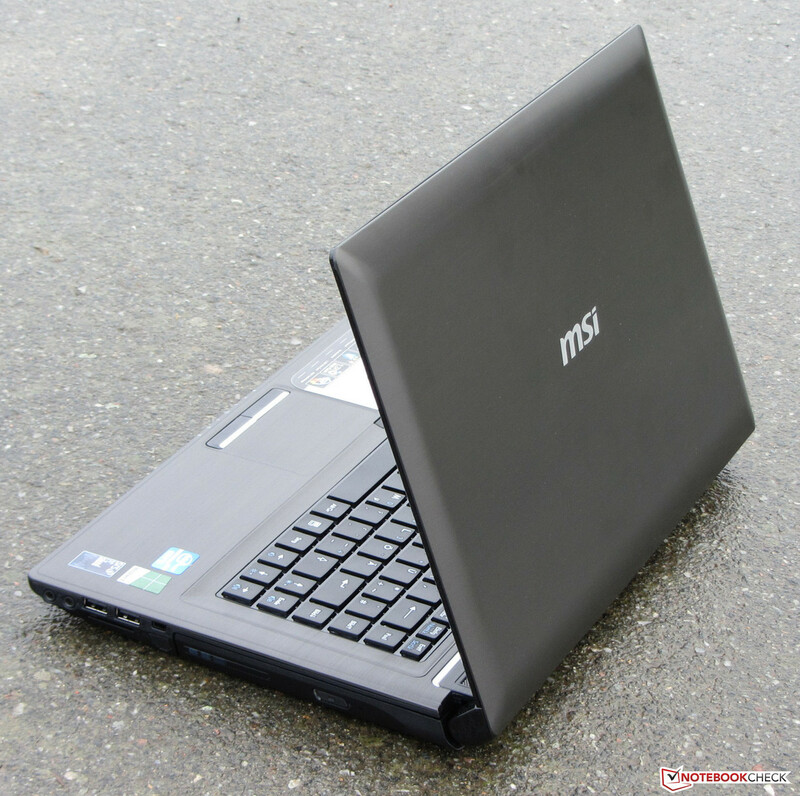 MSI's laptop proved to be quite energy-efficient in idle mode and was satisfied with a power consumption between 6.5 and 10.8 watts. Neither the Vostro (9 to 14.9 watts) nor the B43E (10.3 to 15.5 watts) can compete with that. With 39.5 watts, the CR41 also coped with less power in the medium load range (3DMark06) than the Vostro (66.6 watts) or Asus' laptop (43.8 watts). This was also true for full load operation via Prime95 and Furmark. The CR41 (52.5 watts) and B43E (53.2 watts) were neck and neck while the Vostro (64.4 watts) was clearly defeated. The CR41's 65 watt power supply unit was never pushed to its limits. The CR41 achieved an idle runtime of 8:01 hours. The Vostro's runtime (5:44 h) and Asus' laptop (4:57 h) are far behind that. 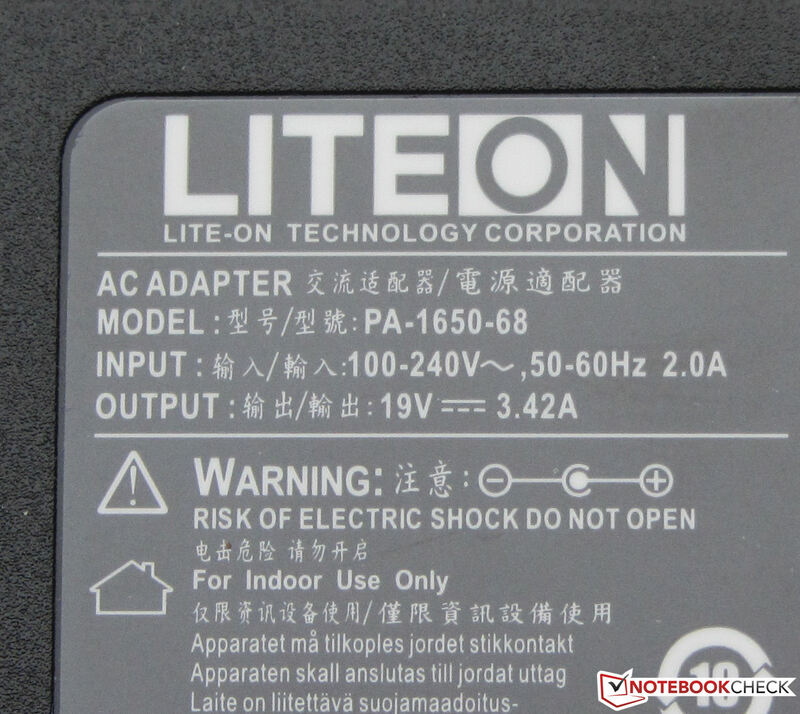 We ascertain the idle mode using Battery Eater's Reader's test. The screen is set to minimum brightness, energy-saving mode is enabled and the wireless modules are disabled. MSI's laptop shut down after 1:15 h in the load test and is thus on a par with the Vostro. Asus' B43E clearly stands out with a runtime of 2:31 h. We run Battery Eater's Classic test on the laptop in the load test. The screen is set to maximum brightness, high-performance mode is enabled and the wireless modules are enabled in this case. One battery charge kept the Wi-Fi test running for 4:10 hours. The contenders did not last as long (Vostro: 3:52 h; B43E: 3:19 h). Websites are automatically opened every 40 seconds in the Wi-Fi test, energy saving mode is enabled and the screen's brightness is set to approximately 150 cd/m². Playing a DVD was possible for 3:28 hours. The CR41 is marginally ahead of the Vostro (3:22 h) but clearly in front of the B43E (2:51 h). The DVD test is performed with enabled energy saving mode (or a higher profile should the DVD not run smoothly), maximum screen brightness and disabled wireless modules. 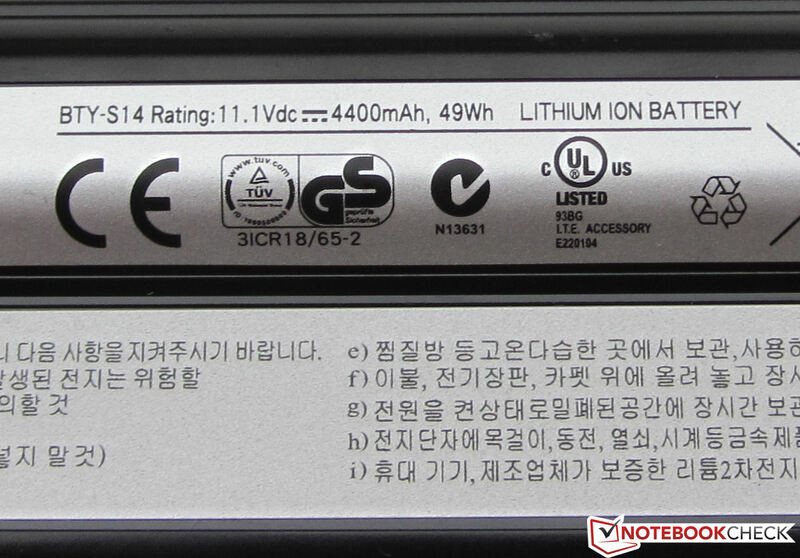 The runtimes of the three laptops can be compared well because the batteries all have a similar capacity (MSI: 49 Wh; Dell and Asus: 48 Wh). 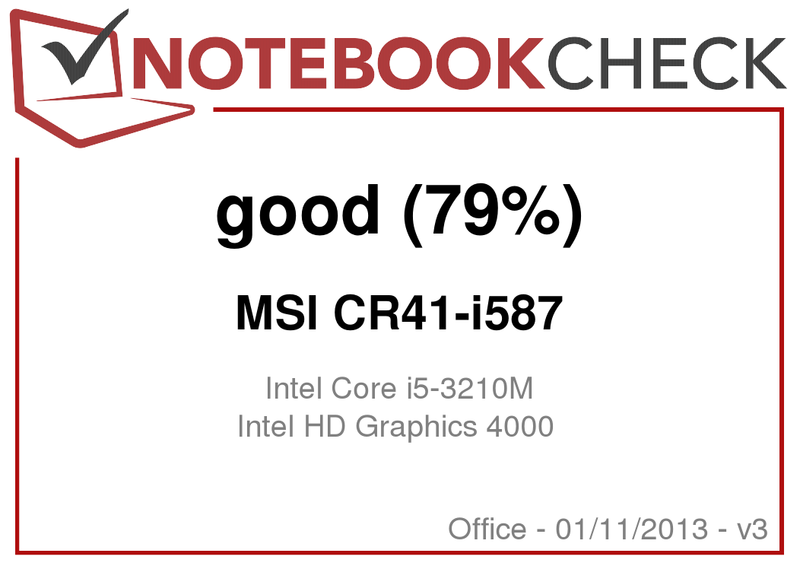 MSI's CR41-i587 scores with good performance development and a correspondingly good application performance. 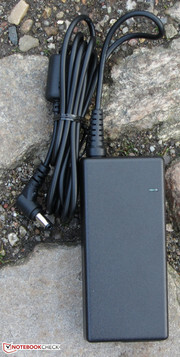 The device also earns credit for its moderate power consumption. Beyond that, the battery runtimes are within an acceptable range. However, it also has its shortcomings. The laptop is a bit too loud over the entire load range and the screen also deserves reproach. Although it provides good contrast, it is overall only mediocre. Asus' B43E would be interesting for anyone who is looking for a downright business laptop but do not want to invest too much money. At a price of approximately 620 Euros (~$825), it includes more interfaces, TPM and even a docking port. The corresponding docking station is available for around 150 Euros (~$199). The Vostro would come into question for users who value a good-looking laptop. The 3460 is superior to its contenders in this category. The extensive configuration options also speak for Dell's laptop. The Vostro is available for roughly 600 Euros (~$798) in a similar configuration as the CR41. Users who would be satisfied with the power of a Core i3 processor can get the laptop for below 500 Euros (~$665). The DVD drive reads and writes all kinds of DVDs and CDs. and can provide up to 65 watts. 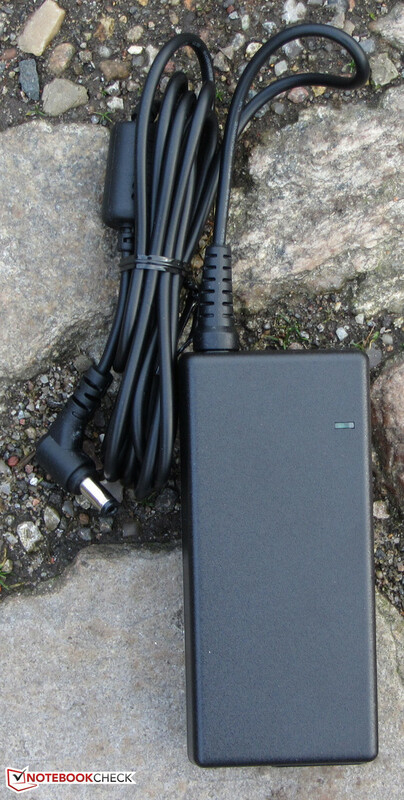 and supplies a power capacity of 49 Wh. Even the CPU can be replaced. Cleaning the fan is no problem. The hard drive can be replaced quickly. 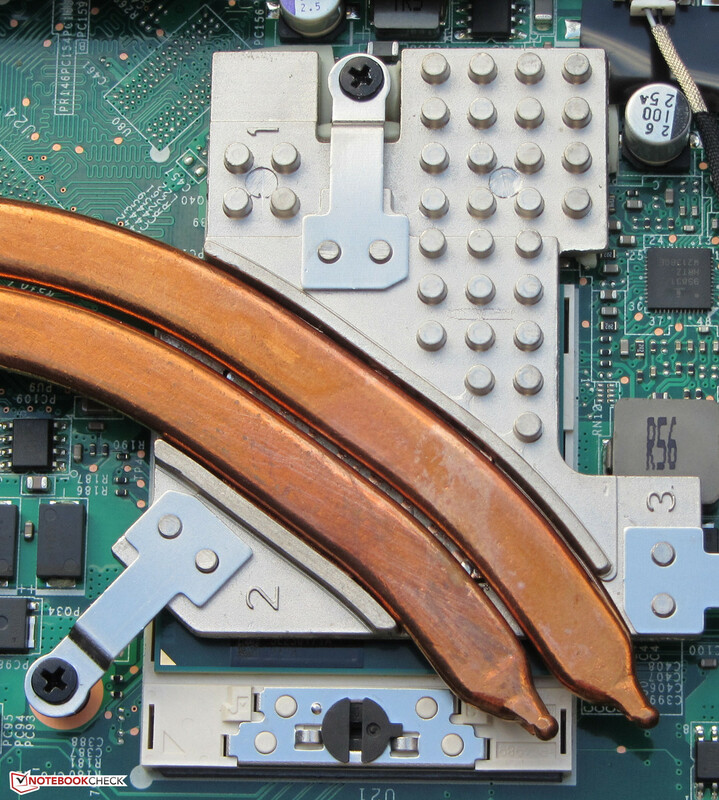 The CR41 features two working memory banks. The preinstalled SRS PC Sound software clearly improves the sound. The speakers are beside the hinges. 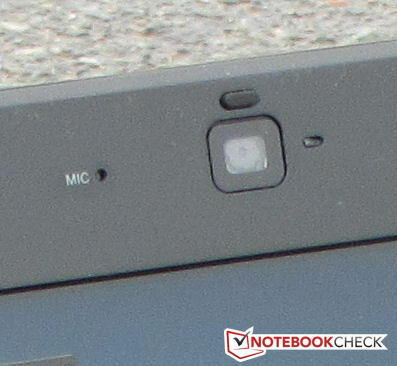 A microphone is located directly beside the webcam. A better screen and more appealing looks. MSI manages to tickle out test results from the Core i5-3210M and HD Graphics 4000 array that partly belong to the top rates that we could ascertain from this combination.